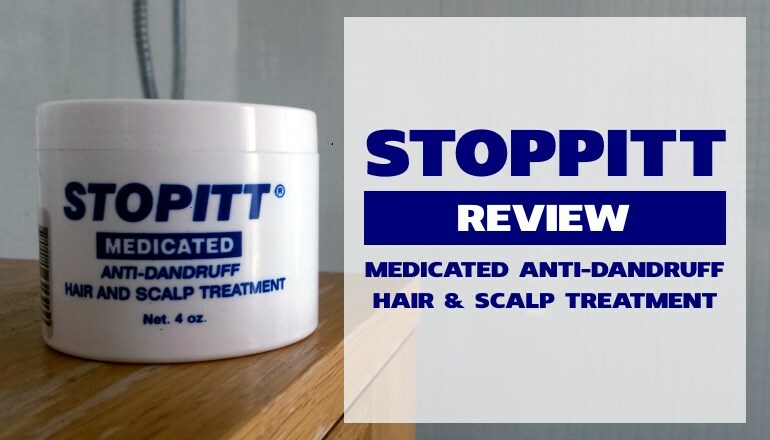 Have a sensitive, irritated case of dandruff caused by seb derm or dry scalp? Yes? Then you may just have found the perfect anti-dandruff shampoo for you. With an ultra-clean ingredients list, a new-age dandruff fighting active (piroctone olamine) and plenty of scalp moisturizers, Sebclair shampoo at first glance promises to be a standout pick. But before we get carried away, let’s start at the beginning. Who makes Sebclair shampoo? 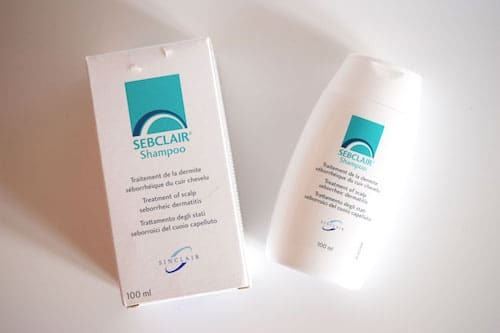 Sebclair shampoo for dandruff and seb derm was prior to 2016 owned by a pharmaceutical company called Sinclair. To this day bottles of Sebclair shampoo – like the one we’ve tested today still bear the logo of Sinclair. At this moment, however, Sebclair shampoo is owned by a company called Alliance Pharma. In 2016 Alliance Pharma purchased over 25 health brands from Sinclair, leaving Sinclair to specialize in volumizing facial aesthetics. Goodbye Sinclair, hello Alliance Pharma – a publically owned pharmaceutical company whose vision is to breathe life into medicines around the world. Founded in 1996 and fostered by healthcare giant Novartis, Alliance Pharma now own over 90 specialty brands. With such prominent backing Alliance Pharma and their Sebclair shampoo can absolutely be trusted with your sensitive seb derm, dandruff affected scalp. Box number 1 ticked. Now, what about the shampoo itself? Apply Sebclair shampoo on damp hair and massage gently. Leave to act for some minutes and rinse. Use 2/3 times a week or according to necessity. You’ll want to use a decently sized dollop of shampoo, the creamy liquid lathers with small bubbles meaning it takes a little more time to spread/work on your scalp. With no added fragrance and no ingredients added to cause a sensation on your scalp, you almost wouldn’t know Sebclair shampoo was in action – great news for sensitive scalps. On washing out the Sebclair shampoo rinses well, leaving hair feeling thoroughly cleansed. Now onto the ingredients, do they work? Are they going to be effective for you? Should you be wary of any potential allergens, irritants or sensitizers? 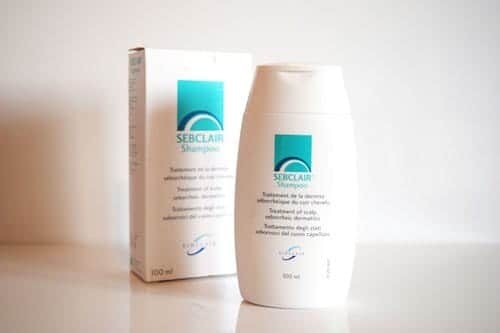 The Sebclair shampoo formula combats seb derm primarily through it’s one active ingredient; piroctone olamine. Piroctone Olamine is an anti-fungal targeted at reducing your scalp population of Malassezia yeast. Too much of this Malassezia yeast on your scale will cause dandruff-like symptoms in seb derm sufferers. When their populations are reduced, dandruff symptoms subside. As a standalone dandruff fighter, piroctone olamine is considered an able for everyday use active being much gentler than traditional ketoconazole or selenium sulfide shampoos. Meaning for mild to moderate seb derm, Piroctone Olamine is a reliable active. Studies prove it. After 4 weeks use a 0.75% formula of piroctone olamine was highly effective at reducing dandruff. While other studies show a 1% formula of piroctone olamine is effective in reducing oiliness of your scalp, increasing hair thickness and reducing hair shedding. Perfect benefits for seb derm and dandruff prone scalps. Pro-tip: If your sensitive scalp has more than a mild to moderate case of seb derm or dandruff, consider Sebclair shampoo an in-between everyday use up-keep. Now, what about the other ingredients in Alliance Pharma’s Sebclair shampoo? Are they friendly to sensitive scalps? 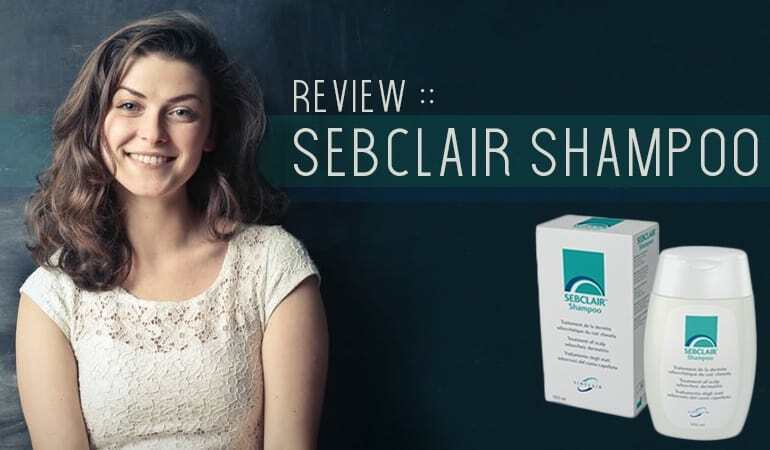 A complete standout of the Sebclair shampoo formula is the first ingredient listed– usually, you’ll find water, in the Sebclair shampoo you’ll find sorbitol. Sorbitol is a humectant aka an active which attracts water to itself. When such an ingredient’s near your scalp, skin can be hydrated and soothed. Great news for dry scalp sufferers. It’s also an ingredient used to break down biofilms. Did you see all those mild marks? Sebclair shampoo for dandruff really does stand on the shoulders of most other formulas. The cleansing ingredients are all perfect for sensitive scalps, have no significant ingredients likely to cause contact dermatitis and this shampoo still washes oily hair and scalps extremely well. And on top of this Sebclair uses an ultra-mild, natural preservative system, no essential oils, no fragrance, no parfum and no allergens. Bottom line: If you have an extremely sensitive scalp but suffer from dry scalp or mild/moderate seb derm, Sebclair shampoo is the embodiment of your perfect remedy. Too bad we are not getting this in India, I would have loved to try this. You’re giving this 4 stars on price? It’s $75 for 3.5 oz. As far as I can tell, this shampoo is normally sold and distributed only in the European Union. I live in the US. 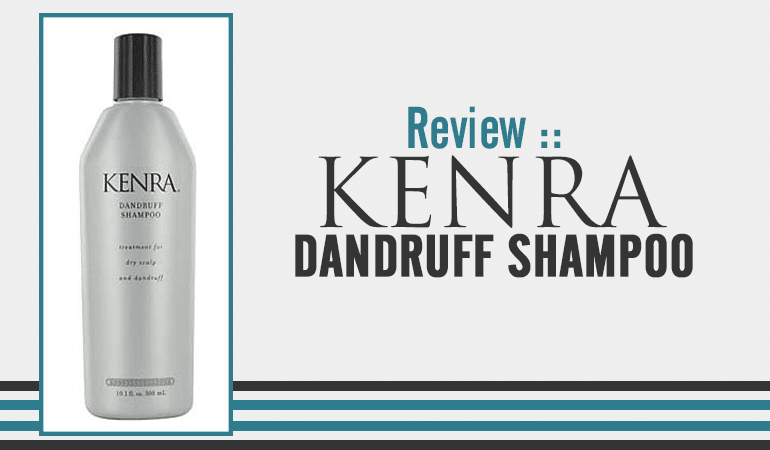 I looked this shampoo up on Amazon.com, and it only had a couple of third-party-seller listings and the price was very expensive – $50 and $68. That may have been where you saw the price of $75 for this. However, I searched for more mentions of this product online, and found a rosacea discussion group where some commenters had said that they ordered this for about $20 (for the product itself), plus $10 shipping, from a website that ships worldwide. If you are interested in ordering it that way from a site in the EU, just look the relevant terms up in a search engine, and compare prices and shipping procedures. That is still a lot to pay for a shampoo, of course. However, if it works really well, and you’ve tried all the other options that you could find locally but they didn’t work so well for you, it might be worth the $30. For myself, in the last few months I’ve spent at least an extra $200 on shampoos/conditioners, but none of them helped my situation. Indeed, I think that I’m worse off now than I would have been if I hadn’t changed anything and had stayed with the irritating, cheap, ordinary, irritating-chemical-soup shampoo I had been using for the past few years. But what can one do — one has to try to heal one’s skin. I wish that these companies would make trial-size bottles available, so it wouldn’t be such an expensive process to try their products out. Obviously this kind of project would involve quite a bit of organizing on your part in the beginning, but seriously, the way retail companies are taking seriously and investing in internet “influencers” (a term I don’t like, so I use it grudgingly) these days, and the very unique position that your site seems to have at this point in time (it’s the only one that I have found that has done such extensive reviews as well as general education articles), you could really answer the needs of an underserved market niche if you made available trial packs of these products. In addition to selling them individually, you could do a a Chris’-top-five or Chris’-top-ten pack, and you could further differentiate the trial packs by your various categories of formaldehyde-free, methylisothiazolinone-free, fragrance-free, botanicals-free, etc. You could also sell a trial container of the Biom8 oil, etc. 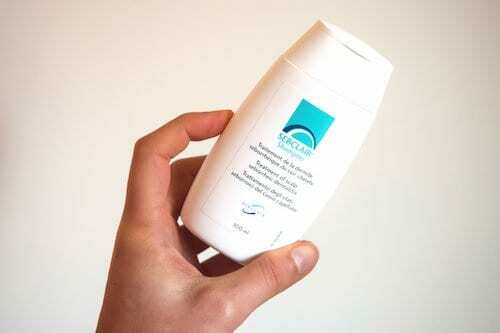 I use Sebclair now, after not being able to get Oilatum Scalp treatment any more. Sinclair works well for me. I use it approx. 2x weekly and then use Faith In Nature (the no fragrance one) the rest of the time. This works really well for me. Sebclair is not cheap, but this way it stretches it out.